The stylish Swedish capital of Stockholm comprises an archipelago of fourteen interesting islands; each with their own unique charm, depth of culture and history. Made up of winding waterways, green parklands and wonderfully well preserved medieval architecture, the city is a happening, fashionable and vibrant capital, steeped in infamous modern Swedish design combined with a stylish way of life. Stockholm is a small city scattered with captivating sites, world-famous restaurants, and a buzzing nightlife scene. Take ambling walks along tranquil waterfronts, jump on a boat to the next island, or choose to take the accessible metro system to see the Stockholm’s top attractions. Whether you stay in chic, upscale hotels, spend a weekend in a designer hotel, or perhaps a week on the water in one of the city’s eccentric houseboat hotels, the accommodation options in Stockholm are varied and plentiful. 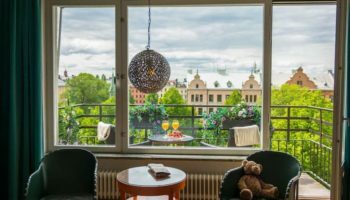 Each area has its own unique charm, style and culture, so here is a guide to some of the best places to stay in Stockholm including the city’s most attractive areas. Swirling Norrmalm is a modern business district which comes fully packed with a bustling city life. Commercial, contemporary, and great for those who love a spot of shopping, there are plenty of sites for visitors to explore; including the cutting-edge architecture of the Kristallvertikalaccent glass obelisk building and the central landmarks of the Hötorget Buildings. Not just about urban modern life, Norrmalm is also where you can find the Royal Opera, St. Jacob’s Church, and the ornate Sweden House. Big international hotel chains make up many of the hotels in this district and offer a high standard of service; they are also within walking distance of most of the top amenities. 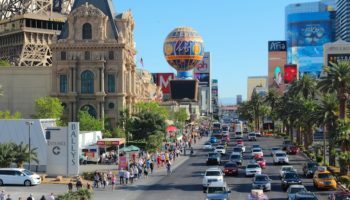 Staying in this central area is perfect for those who want to be downtown amid the vibrance of city life, and great for travelers who only have a couple of days to see what the city has to offer. Norrmalm Central Train Station and access to the T-Centralen metro makes visiting the various other top areas of Stockholm speedy and straightforward. At Six – This cool design hotel, located just a 10-minute walk from Stockholm central station, is an enclave of style (with a touch of luxury) in a city that’s already all about design-led style. Featuring understated interiors that ooze sophistication, and with fantastically accommodating staff, At Six is the sort of hotel you’ll never want to leave – especially with the restaurant that serves up top-notch cuisine, a wine bar, outdoor terrace, as well as the gym. You can even mix a cocktail for yourself in your bedroom if you like! Hotel C Stockholm – Home to Stockholm’s world-famous Ice Bar, Hotel C is a fun and comfortable place to stay. The bonus is that it’s just a stone’s throw from the Swedish capital’s Old Town, meaning you’ll have plenty of opportunities to easily explore the storied streets and amazing architecture for yourself. At the onsite Ice Bar, the cocktails are served in glasses made of ice as you sit on seats made of ice at a bar – you guessed it – made of ice. As for food, chow down on American grub at the in-house 1950’s-style diner. Scandic Klara – This eco-friendly 4-star hotel features rooms decorated in a simple and modern style, with a cafe downstairs in the lobby done very much in the style of industrial chic – think exposed pipes and concrete. In summer, enjoy a Scandinavian breakfast in the courtyard before heading out to explore the nearby shopping and city sights; you could even catch some live music at the nearby Stockholm Concert Hall. 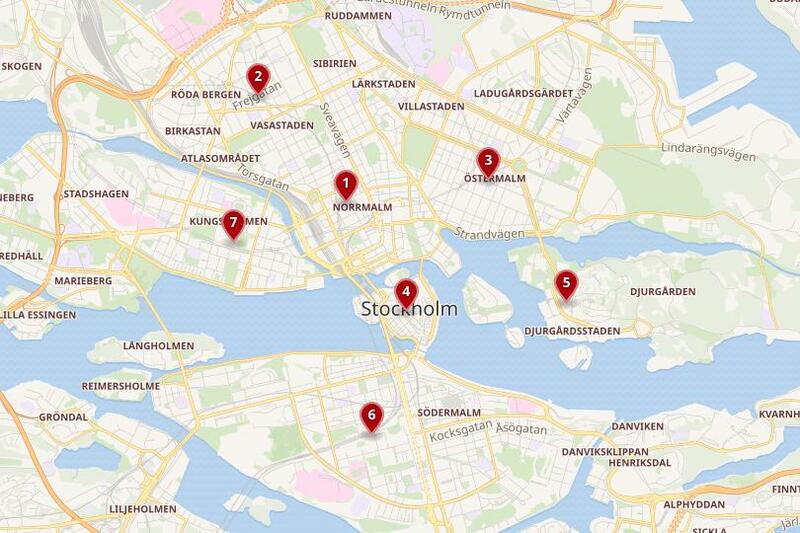 As a locational bonus, Scandic Klara is just 500 meters from Stockholm central station. Central Hotel – A nice boutique-style hotel with contemporary decor and quirky touches of style, bedrooms here are well sized and come complete with wooden floors and artwork of the city (so you don’t forget where you are). Central Hotel is a simple offering with all the comforts and amenities you’d expect from a central city hotel. Enjoy meals at the fun onsite restaurant, where you can also feel connected to the life of the city since the large windows boast panoramic views of Stockholm’s streets. If you are looking for a busy, bustling area of the city, then you should stay in vibrant Vasastan. This is the area where the locals live, along the stunning streets of what is nicknamed the ‘Stone City’. Vasastan stands out from the rest of Stockholm with its mix of German styled architecture set along wide streets. The best place in the district to see this funky design style is along Rörstrandsgata. Cute cafes with chic locals line the streets, cool kids wander around antique furniture shops and relaxed families enjoy days out in Vasaparken Park or browsing at the Stockholm Public Library. There are also many fashionable bars and restaurants; visitors to Vasastan really must try these out in order to get a good understanding of life in the area. Stay in one of the many charming mid-range hotels and travel around the city via the new commuter rail station. Hotel Birger Jarl – Featuring rooms that are decorated in warm colors and plush fabrics, the Hotel Birgir Jarl is chic and contemporary. This hotel is well located if you like the nightlife as well as the highlife; it’s just a 10-minute walk away from Stockholm’s nightclub and shopping district. The metro is also close by, but of course, it’s also easy to walk to some top sights nearby, including the beautiful Humlegarden and Stockholm Royal Palace. After a busy day, return to your hotel and enjoy a Swedish dinner at the restaurant and a drink or two at the lobby bar. Hotel Hellsten – Hotel Hellsten is situated inside a lovely, historic old building; it’s used those original features throughout as design touches pointing to Stockholm’s past. There’s hardwood floors, timber beams, and exposed brick walls. Rooms here are varied: some are relatively compact, whilst others are spacious and grand in style, with fireplaces and four-poster beds. This charming hotel also offers a buffet breakfast every day in its conservatory, and live jazz every Thursday in the bar. Just a five minute walk away from the hotel is the pedestrianized street of Drottninggatan. Hotel Tegnerlunden – True to its name, this 3-star offering overlooks Tegnerlunden Park – one of Stockholm’s major parks – and boasts beautiful, leafy views from its windows. Its quiet location makes it a peaceful place to stay in the city, yet from here it’s an easy walk to the Old Town as well as the Royal Palace – but you can always stick around this area for lovely strolls around the park itself. Back at the hotel, rooms are decorated in natural colors to reflect the surroundings and are spotlessly clean. 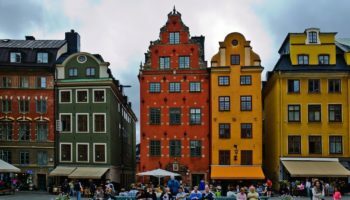 If you want to spend time in the Swedish capital wining and dining, then the central and sophisticated Östermalm area is for you. Perfect for those who are visiting on business, there’s quick and easy access to transport to get around the rest for the city, and great shopping with upmarket global labels and boutiques around Stureplan Square. Exclusive and elegant, this area of this city is all about the high-end lifestyle. Classy nightclubs and busy bars serve expensive cocktails and decadent dishes to Stockholm’s late night party-goers. Take a trip to the Östermalmshallen Food Market for a chance to sample some more traditional Swedish food before walking off your lunch at one of the many green parks. Humlegården park is entrancing as it encircles the Royal Library, and there are also numerous museums along Strandvägen Boulevard to explore. This is the area with the most expensive real estate in Stockholm, so perhaps not the ideal district for travelers on a budget. Hotel Diplomat Stockholm – This impressive hotel is set in an incredible Art Nouveau building which dates back to 1911. 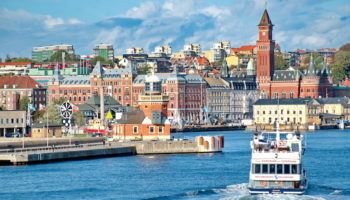 Located overlooking Nybroviken Bay, Hotel Diplomat is a bastion of class on the already upscale Strandvagen Boulevard. The breathtaking interiors of this amazing hotel were designed by renowned architect Per Oberg, for the ultimate cocktail of contemporary cool and classic elegance – think carved wooden staircases, sleek furniture, and calm color palettes. You can taste modern twists on local Swedish cuisine in the chic hotel restaurant, or on a sunny day, eat al fresco on the waterfront terrace. Mornington Hotel Stockholm – With its palette of greys, dark wood floors, and just five minutes from the vibrant Stureplan Square, this hotel is a great place to stay for a splash of style as well as bustling city life. Enjoy the comfortable armchairs and interesting touches such as the library and record players at Mornington Hotel Stockholm. The restaurant here has a selection of different cuisines on offer, but most famously serves up a delicious brunch at the weekend. You can even keep up with your workouts at the onsite fitness center if you want. Hotel Riddargatan – Charming and well designed, Hotel Riddargatan boasts rooms with bright color pops and sleek contemporary style, as well as hardwood floors and a handy writing desk (you might need to get some work done). There are even dumb-bells in the rooms and maps of jogging routes in the area – plus the breakfasts served up here are fresh and healthy. If you’re into artwork, the National Gallery is just 10 minutes away on foot, and so is the impossibly picturesque Old Town of Stockholm. The Kungstrad Garden Park is a few minutes stroll away. The historic old district of Gamla Stan is the medieval center of Stockholm. The heart of the inner city, this is where important cultural and historic buildings are found. It is home to many of the iconic sites of the city, including the Swedish Parliament, Royal Palace, and popular Christmas markets and museums, all set along tiny cobbled streets. Wander around this district and explore what’s on offer. The best thing to do is discover the town’s old secrets for yourself, stumbling across street cafes and beautiful bars next to bijou boutiques. Gamla Stan boasts fantastic accessibility to the metro system, where two of the main metro lines meet, or you could take a walk; anywhere in the center of the city is within easy walking distance, or you can try out the commuter ferry. There is a plethora of accommodation in this charming quarter, which means you have a fun choice of sleeping in a quirky old building, a trendy modern hotel, or why not a cabin on a boat? First Hotel Reisen – First Hotel Reisen is fantastically set in a grand 17th-century building and is itself only 150 meters from Stockholm’s Royal Palace. The building is elegant and elaborately decorated with ornate Baroque features, and also boasts large windows and rooms that have been tastefully decorated with touches of contemporary luxe and modern minimalism. 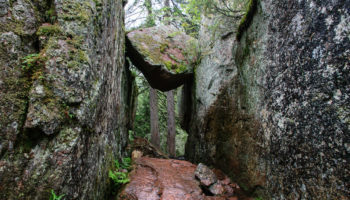 Inside the vaulted cellar, you can enjoy the fitness center, complete with sauna and cold plunge pool. There are also massages and beauty treatments available. The bar here regularly hosts well-known DJs, too! Collector’s Victory Hotel – Two minutes’ walk from Gamla Station, staying in this hotel right in the heart of Stockholm is a comfortable and convenient experience. The staff are extremely helpful; you’ll be welcomed into the warm environment and offered tips and suggestions about sightseeing. Elsewhere, you can recline in the elegant – and historic – opulence of the traditionally decorated bedrooms boasted by the Collector’s Victory Hotel. There’s a strong naval theme running through the hotel and it doesn’t stop at the guest rooms. Family-orientated and laid-back, Djurgarden is popular with the people of Stockholm who come to this area to relax. The neighborhood is set on a small island which is made up of designated royal parkland and crisscrossed with pathways perfect for taking a leisurely stroll and enjoying the scenery of the city. 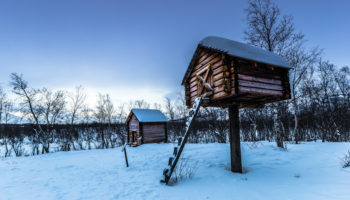 There are numerous attractions to take a look at in the district, including the fun ABBA Museum, the Vasa Museum, and open-air Skansen living museum. 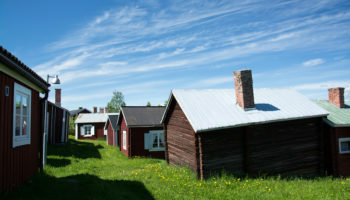 The unique island is sprinkled with colorful cottages and sweet cafes clustered around the streets and, along with the museums, celebrates the best aspects of life in Sweden. There are many harbors on the island, which means ferries are easy to come by, or you can take the number seven tram from the island. Stay in old houses which are surprisingly affordable for such a popular destination, or one of the beautifully designed boathouses on the river. Pop House Hotel – Fans of Abba rejoice – this hotel is located in exactly the same building as the Abba Museum! You can easily tour yourself around the museum as many times as you feel like – depending on how big a fan you are. The hotel interiors are funky and urban in style and the hotel provides everything you could need, including an in-house restaurant. Pop House Hotel is a little far out of town, but it’s only a five-minute tram ride into central Stockholm; the tram stop is right outside. Another attractive island in the city is Södermalm. This is a fantastic place to stay in Stockholm for travelers who want to explore a more creative and trendy side of the Swedish captial. The open-minded, LGBTQ-friendly district is set downtown and is so popular it even has its own stop on the red metro line. This alternative area is awash with concept cafes, independent clothes shops, busy bars and creative dining options. This is where the Swedish aesthetic and the creative imagination of Stockholm come to life in an animated, artistic area; where cutting-edge culture and historic architecture combine in happening Södermalm. 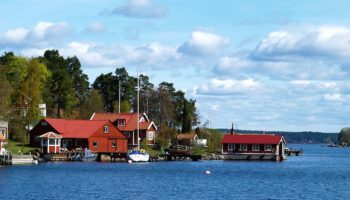 Stay in one of the cute and colorful Swedish cottages along the river, or in one of the many homely apartments that are situated along the tree-lined Tantolunden park. There’s also some affordable hostel accommodation in Södermalm, which is often based around innovative and fun design. Clarion Hotel Stockholm – Just 15 minutes from the Stockholm City Museum and a mere few minutes walk from the historic Old Town, staying at the 4-star Clarion Hotel Stockholm is a great option if you want to hit up the city’s sights. The hotel restaurant serves up delicious dishes based on South and Central American cuisine, so if you’re into tacos and margaritas, this is the place for you. The rooms themselves are clear-cut in their minimal decor and come complete with cool, design-led furniture and fittings. Hotel Hellstens Malmgård – With its refined interiors – boasting four-poster beds and heritage design – this elegant hotel dates back to the 18th century. Rooms are decorated in a quirky, eclectic style, with a nod to the building’s history. Staying at Hotel Hellstens Malmgård means taking breakfast every morning in the basement inside a period brick vault, making for a unique way to start the day; for those who like a bit more fresh air, there’s also an outdoor terrace. It’s also very close to the train station, so it’s easy to get around the city. Don’t miss out the delights of the Kungsholmen area of Stockholm. Made up of predominantly residential buildings, this island offers a secluded and relaxing place to stay in the busy city. 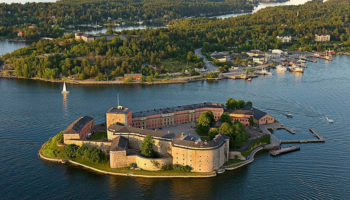 Perfect for travelers who really want to get away from it all, this Stockholm summer holiday spot offers the chance to try out kayaking. It even has access to the beaches of Smedsuddsbadet and Fredhällsbadet, plus some chilled waterfront boardwalks. 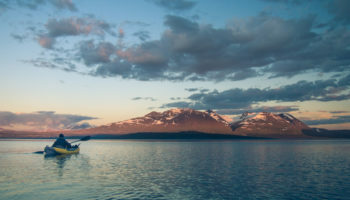 Restaurants, bars and lakefront cafes invite you to sit and watch the local life of the neighborhood. It’s easy to spend a laid-back afternoon strolling along the waterside walks, stopping for lunch at one of the traditional eateries. This isn’t a district for sightseeing, with the main landmark here being the City Hall, but the area is generally much more budget-friendly than the rest of Stockholm. 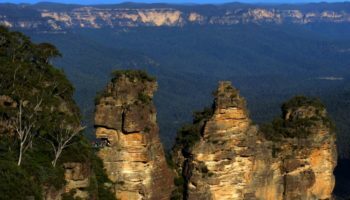 Accommodation here is great for travelers who have a tight budget, and is often much cheaper than the more central districts. With access to Stockholm metro, the city’s tourist attractions are just a short train ride away. Clarion Hotel Amaranten – With supremely helpful staff and an extremely delicious breakfast served up every morning, Clarion Hotel Amaranten is also a great place to stay with children – in part, thanks to the laid-back dining options on offer. The rooms here are smart with a touch of sophistication, and there’s also an onsite fitness center and sauna for guests to work out or unwind after a busy day. Plus there’s a 1960’s themed cocktail bar at this hotel, which makes for a cool way to spend an evening. Sky Hotel Apartments – Featuring apartments and furnished condos, Sky Hotel Apartments is a stylish option when it comes to exploring the cool side to Stockholm’s more affordable accommodation. Keeping costs down, there’s laundry facilities, a tasty buffet breakfast included in the room rates, as well as kitchenettes in every room. The terrace here is a cool place to hang out (when weather permits, of course), plus there’s also a sleek restaurant where they serve up tasty food so you can eat without having to venture outside. It’s also just a one minute stroll to the Lindhagensgatan bus station.